Four simple phrases-"Please forgive me," "I forgive you," "Thank you," and "I love you"-carry enormous power to mend and nurture our relationships and inner lives. These four phrases and the sentiments they convey provide a path to emotional well-being, guiding us through interpersonal difficulties to life with integrity and grace. 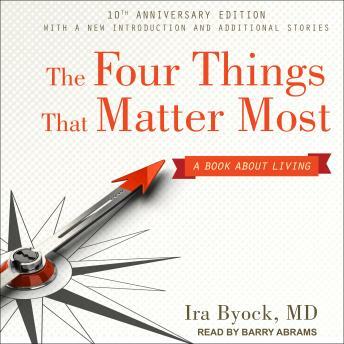 Dr. Ira Byock, an international leader in palliative care, explains how we can practice these life-affirming words in our day-to-day lives. Too often we assume that the people we love really know that we love them. Dr. Byock demonstrates the value of "stating the obvious" and provides practical insights into the benefits of letting go of old grudges and toxic emotions. His stories help us to forgive, appreciate, love, and celebrate one another and live life more fully. Using the Four Things in a wide range of life situations, we can experience emotional healing even in the wake of family strife, personal tragedy, divorce, or in the face of death. With practical wisdom and spiritual power, The Four Things That Matter Most gives us the language and guidance to honor and experience what really matters most in our lives every day.